Think jazz music and jazz festivals are purely urban phenomena? The masterful pianist Monty Alexander, Jazz on the Chesapeake and Chesapeake Chamber Music want you to think again. Given the close proximity to the DC metro area of Maryland’s Eastern Shore on the Chesapeake Bay (depending upon Bay Bridge traffic, its roughly a 90-minute or less drive to the Eastern Shore from the DC area), I had certainly heard of the Monty Alexander Jazz Festival, plus there aren’t a lot of jazz festivals (consider the various Shakespeare or Beethoven festivals around the world) named after a musician. Last spring when Monty celebrated his 70th birthday with a rousing Howard Theatre performance, one which was a potent mix of jazz, reggae, ska and the mento root source of Monty’s native Jamaica, afterwards when chatting backstage with the pianist he waxed rhapsodic about his festival and suggested we check it out. Normally either of the two free Labor Day Weekend festivals in Chicago or Detroit, excite the travel impulse. 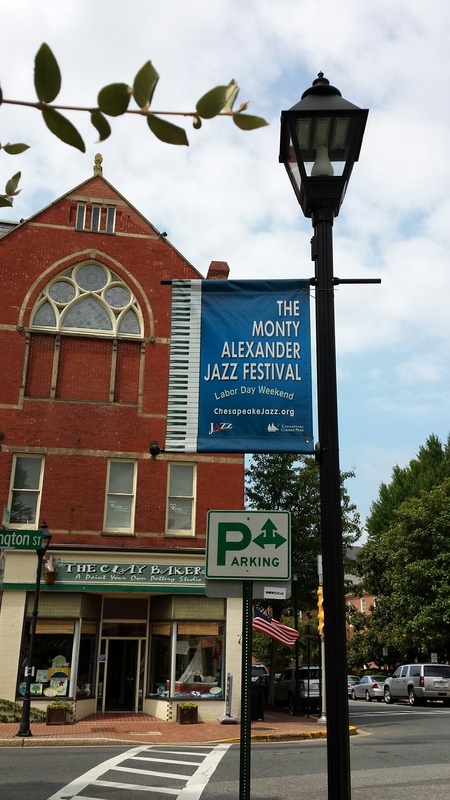 But given the close highway proximity of the Eastern Shore and the inviting prospect of sparing the agonies of the airport/airline spin cycle, the Monty Alexander Jazz Festival sounded more intriguing by the moment. The journey proved to be a wise move, from several perspectives – not least of which was the music. But first a little background. How exactly did Monty Alexander come to be artistic director of his own jazz festival, in Easton, MD? In 2008 Al Sikes, a thoughtful man whose career included stints in law, government services, and business, with a minor in jazz enthusiasm, following retirement communicated with an old friend and past president of Chesapeake Chamber Music with whom he shared twin musical passions for jazz and classical music. At that point Chesapeake Chamber Music hadn’t yet dipped its toes into the jazz waters, but the organization was intrigued by the possibilities and Sikes was charged with producing their first jazz concert. Through another friend Sikes connected with Monty after a concert performance and in ’08 arranged for the pianist to play that first Chesapeake Chamber Music jazz concert at The Avalon Theatre in Easton, MD. For those not familiar with Easton, its part of a chain of small burghs on the Eastern Shore of the Chesapeake, including touristy St. Michael’s Island, and Talbot County is the birthplace of the great Frederick Douglass. Easton is a lovely, tranquil, green town, at the heart of which, nestled among several inviting restaurants and assorted shops is the 400+ seat Avalon Theatre. Monty’s 2008 concert at the Avalon was such a hit that, “After the concert we met in New York,” Sikes related, “concluded arrangements and began the [Monty Alexander Jazz] Festival in 2009 with two concerts.” Sikes also credits mutual friend Bill Edgar, who had written liner notes for the pianist. Thus began the Jazz on the Chesapeake presentations of Chesapeake Chamber Music. “Chesapeake Chamber Music (CCM) views itself as being in the small ensemble music business,” continues Sikes, “and they asked me if I would expand their program to include jazz. Jazz on the Chesapeake has grown rapidly and now features concerts plus the festival.” Last year’s CCM jazz concerts, apart from but spurred by the success of the Monty Alexander Jazz Festival, included such artists as DC-based drummer Chuck Redd, tenor man Harry Allen, and longtime Ahmad Jamal bassist James Cammack. Getting to Easton turned out to be an exceedingly pleasant Friday afternoon drive, particularly once we crossed the Bay Bridge into the Eastern Shore area, with its roadside produce stands and gentle shore breezes (tip: adjacent to one such produce market is a food truck dubbed Grumpy’s; order the crab cake or soft shell crab sandwich, you’ll thank me). The historic Tidewater Inn which provides lodging for all the musicians (as we signed in I glanced over and Houston Person was checking in) is mere steps across Easton’s main intersection from The Avalon Theatre. As jazz festivals go, accommodations don’t get any more convenient. Not long after joining the eager and robust lobby crowd for Friday’s concert featuring the fast-rising Trinidadian trumpeter Etienne Charles‘ quintet, in walked Monty. Asked how this festival came to be presented by a chamber music organization, Alexander’s response was simple – these are people who just love good music and the fact that they’ve become so taken with this jazz festival and the ongoing jazz series in general has more to do with the quality of the music than with any sense of genre boundaries. When Suzan Jenkins, who is the executive director of the Montgomery County Council on the Arts & Humanities,was introduced to Al Sikes, the conversation turned to the support network for this festival enterprise. Sikes proudly pointed out that this is a festival which is roughly 80% supported by its box office output, not corporate support, with only modest, approximately 5%, funding support from the public sector, namely the Maryland State Arts Council and the Talbot County Arts Council. The festival’s remaining support comes directly from resident patron contributions. As the Monty Alexander Jazz Festival celebrated its 5th anniversary, that’s an encouraging support formula for a jazz festival. Friday evening many in the packed Avalon Theatre were introduced to Etienne Charles for the first time. Despite the fact that many hadn’t heard the Trinidadian trumpeter, this audience clearly has unquestioned confidence in Monty Alexander’s artistic choices. The Juilliard-trained trumpeter, who also holds an associate professorship at Michigan State University, has over the last several years released a fine series of recordings on the Culture Shock label that highlight his Caribbean heritage, including ancestral links to the island of Martinique and a deep investment in folkloric and rhythmic traditions of Haiti. Possessed of a quick and engaging wit, an ability to tell a story both in his charming introductions and subsequent execution, Charles has evolved a dexterous trumpet style that is beyond trendy and seems poised to deliver him to greater prominence as a bandleader. His musical cohorts, which include bassist Ben Williams, drummer John Davis, piano-keyboardist Kris Bowers, and guitarist Alex Wintz have developed a cohesive, communicative band approach to Etienne’s infectious grooves, which include his clever arrangements of songs from stalwart calypsonians Lord Kitchener and the Mighty Sparrow, as well as forays into the Haitian tradition known as racine. Saturday’s matinee concert featured alto saxophonist Bobby Militello‘s tribute to Dave Brubeck, but tooling around Talbot County beckoned. That evening was Monty Alexander’s signature concert. Each year Monty develops a different theme and flavor for his festival feature, with invited guests joining his core trio of drummer Dennis Mackrel and bassist Hassan Shakur, plus his longtime percussionist Bobby Thomas, who some may recall from his Weather Report stint. Those familiar with Rat Pack lore know about the legendary New York saloon Jilly’s, a favored haunt of Frank Sinatra. As Monty explained to the audience, shortly after the pianist’s arrival in ’61 from Kingston, Rizzo peeped him in Vegas and hired him on the spot to work Jilly’s as house pianist, backing The Chairman and other singers of the day. For this 5th edition of his festival Monty decided to mount a Night at Jilly’s on the Avalon stage. As special guests he engaged ace tenor man Houston Person, whose big, brawny sound and rich, blue tone filled The Avalon every time he stepped up to the mic – eliciting big audience response for each solo, plus crowd-pleasing vocalists Allan Harris and the delightful Italian Caterina Zapponi. 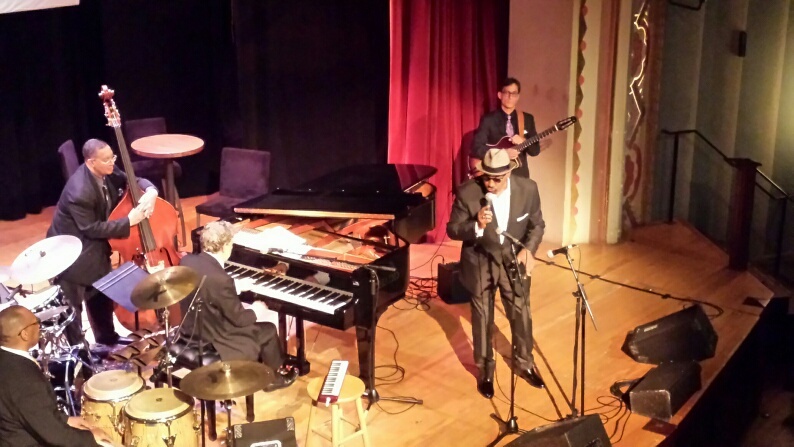 Harris, who always brings a touch of Nat Cole to his straight ahead jazz exploits, has the classic vocal tone and stage manner to represent Jilly’s flavor. Caterina was full of verve as well, particularly winning in French on “C’est si Bon” and delivering in her native Italian as Monty’s representation of Sinatra’s ancestral heritage. Playing largely a program of the classics befitting the singer’s saloon ambience, Monty Alexander swung casually, deeply, and hard in the blue realm when the spirit and the tune called for it, expressing great love for the beautiful instrument provided for the festival by DC piano maker Warren Shadd (read about his remarkable achievement as the first African American piano maker here…http://www.npr.org/blogs/ablogsupreme/2014/05/07/309881323/the-first-african-american-piano-manufacturer). Culinary break… When in Easton, MD, provided you’re a carnivore, you gotta visit The BBQ Joint a grill master as unassuming as its name at the corner of Dover & Aurora Streets just a couple of blocks from the Avalon Theatre and Tidewater Inn. This is the home of killer beef brisket; accompany that with the corn bread and collard greens… you’ll thank me for that one as well. When I spoke with Monty that first evening in The Avalon lobby he waxed rhapsodic about bringing a gospel & jazz element to Sunday’s proceedings, courtesy of soulful Dee Daniels. Ms. Daniels resided in Vancouver, BC for many years and actually established a broad international and West Coast reputation. About three years ago she took the plunge and decided it was time to see what New York had to offer as far as spreading her vocal wings and education chops. Echoing an immortal Saturday Night Live bit, New York seems to have been very, very good to Ms. Daniels who has gotten around town quite a bit, working with a number of top shelf artists. Along the way she became the first vocal leader to record for the decades old Criss Cross label, the quite aptly titled State of the Art. Dee has become second only to Monty as a tradition for this festival, bringing gospel roots and jazz fruits to an eager patronage. For the Sunday matinee closer she delivered equal parts joy, ease of swing, storytelling verve and a depth of blues knowledge that thrilled the Avalon Theatre. Dee Daniels is proof positive that it takes some living to effectively deliver a lyric, never mind the vocal ingenues overcrowding the field these days. A couple of days after the festival her latest recording, Intimate Conversations (Origin Records) arrived. This one will definitely garner some spins on the Ancient/Future radio program (Wednesdays 10-midnight on WPFW 89.3 FM and streaming live at www.wpfw.org). 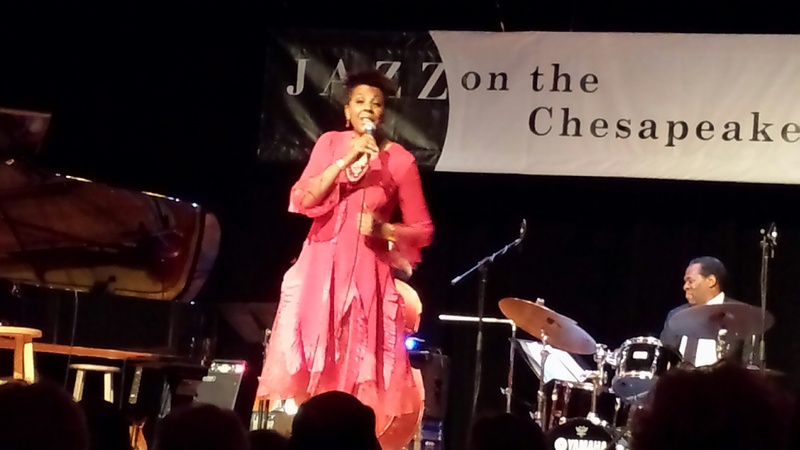 If you haven’t heard Dee Daniels yet (here w/her drummer Dwayne “Cook” Broadnax”)… don’t sleep!